View of the formal gardens at Hampton Court Palce. The original Tudor Palace had by the 18th century been substantially added to by later monarchs. In this view both the sixteenth and seventeenth century buildings are visible. The park at Hampton Court covers some 568 acres of land and is bordered by the road from Hampton to Kingston and the River Thames. 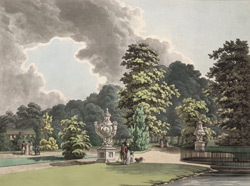 During the reign of Henry VIII the park was a place for hunting and sport and it was not until the 17th century that Charles II had parts of the space landscaped. William III was especially interested in gardening and had the grounds laid out in the French style with three avenues fanning out from the terrace (in the shape of a 'patte d'oie' or a goose's foot! ).